During the 1960s, three great artists used nature as their canvas: Yves Klein painted the sky, Robert Smithson sculpted the earth, and Nicolas Garcia Uriburu painted the water. Strangely, the one of these that spawned a movement was not Uriburu's artistic protest of our pollution of nature, but Smithson's incursions into the wilderness. Nicolas Garcia Uriburu, Coloration of the Grand Canal in Venice (1968). We would like to thank the website of Nicolas Garcia Uriburu and the Universidad del CEMA for the images shown. 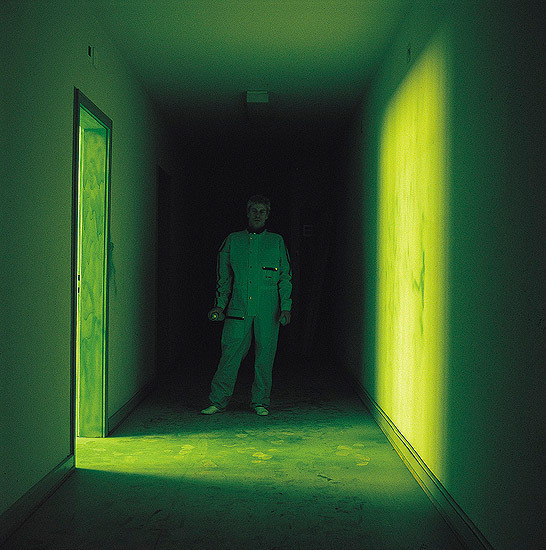 Nicolas Garcia Uriburu pioneered environmental art in 1968, when he shocked the art world by dyeing Venice's Grand Canal green on the eve of the Biennale. He went on to color the Seine in Paris, the East River in New York, the fountains in Trafalgar Square, and many more urban waterways. Joseph Beuys joined him to color the polluted waters of the Rhine. Nicolas Garcia Uriburu with fellow Argentine artist Luis Felipe Noe at Unversidad del CEMA. Uriburu lived in Paris and New York in the late '60s and early '70s. 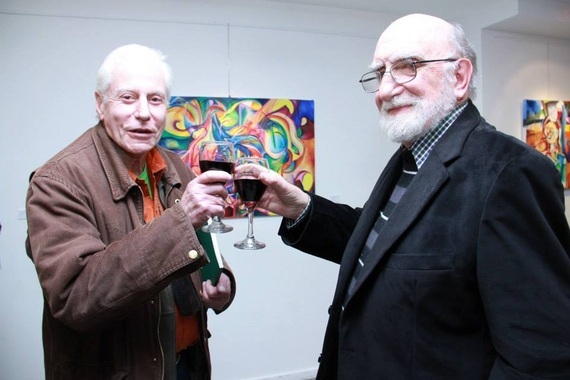 But he missed his native Argentina, so he returned to Buenos Aires, even though it meant declining an offer to join Leo Castelli's gallery in New York. 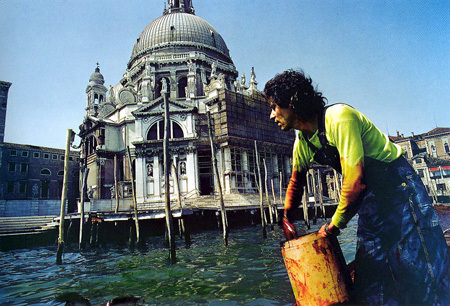 He spent the next four decades making art that celebrated the natural beauty of Latin America, and protested its destruction. As recently as 2010, he teamed with Greenpeace to make a coloration to object to the filth and stench that remain a legacy of Buenos Aires' now abandoned port in La Boca. Nicolas Garcia Uriburu, Pulmón Verde del Mundo (1981). Uriburu's return to Argentina was Latin America's gain, but North America's and Europe's loss. Nicolas was by nature reserved, shy, and dignified, and he lacked the enormous thirst for fame that drove the voluble and self-promoting Smithson. So perhaps this simple difference in personality led to the early establishment of Earth Art, and the corresponding lag in the development of Environmental Art. 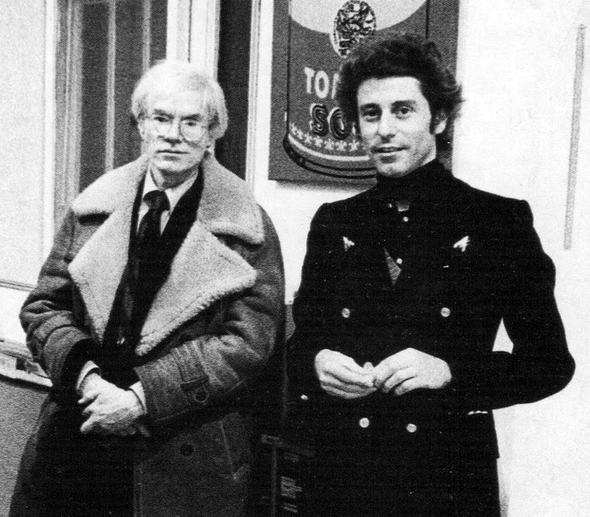 Nicolas Garcia Uriburu with Andy Warhol, New York (1969). Nicolas was a wonderful artist, and a wonderful person. When I first visited his studio, he did not dismiss me as someone who had no standing in the art world, who could not help his career. Instead he responded to my interest in his art, patiently and carefully answering questions about his career, his practices, and his relationships with art world luminaries - Restany, Arman, Warhol, Smithson, and others - in the '60s and beyond. He lectured at Universidad del CEMA as the first recipient of our Creative Careers Award, and attended the subsequent lectures by other major Argentine artists - Marta Minujin, Luis Felipe Noe, Gyula Kosice, Eduardo Stupia. It did not come naturally to Nicolas to engage in extended discussions of his works, for his instinct was to make art that spoke for itself. But he saw that I enjoyed hearing about his remarkable experiences, so he overcame his reticence, and was always a gracious host when I visited Buenos Aires. He was also always willing to take time to advise Julio Elias and me about art events at CEMA. And in magic moments he quietly expressed his pride in what he had achieved with his art. Elizabeth Bishop once wrote that 'There are some people whom we envy not because they are rich or handsome or successful, although they may be any or all of these, but because everything they are and do seems to be all of a piece, so that even if they wanted to they could not be or do otherwise." This was true of Nicolas. His creativity brought him great and richly deserved success, but he never lost his humility before his subject and his discipline. He lived his life in a state of grace, and he generously shared it with others. 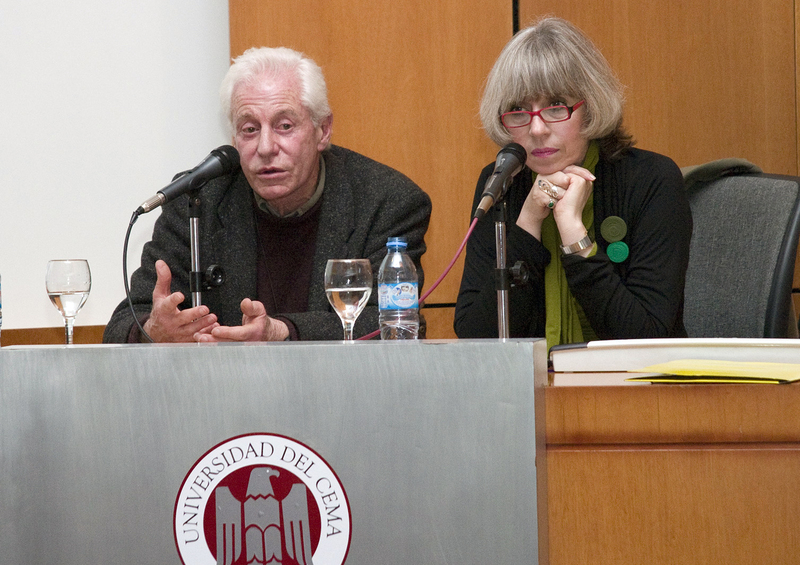 Nicolas Garcia Uriburu with Adriana Lauria at Universidad del CEMA. Nicolas loved everything that was indigenous to Latin America, and he loved art. His studio and home were filled with South American folk and modern art, and his own magnificent works celebrating the natural forms and colors of South America. He is revered in Latin America, his art is prominently displayed in its museums, and he will be remembered throughout the continent. I can only hope that the North American and European art worlds will rediscover his art, celebrate its glory, and follow him in making art that praises the beauty of nature. 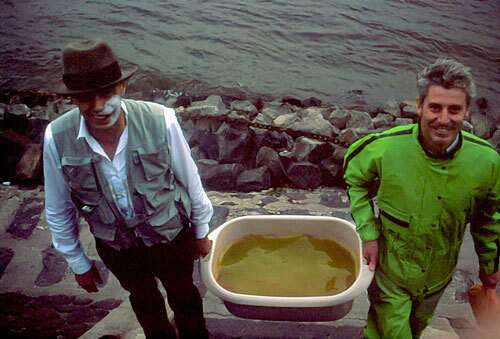 Nicolas Garcia Uriburu and Joseph Beuys executing a coloration of the Rhine (1981).